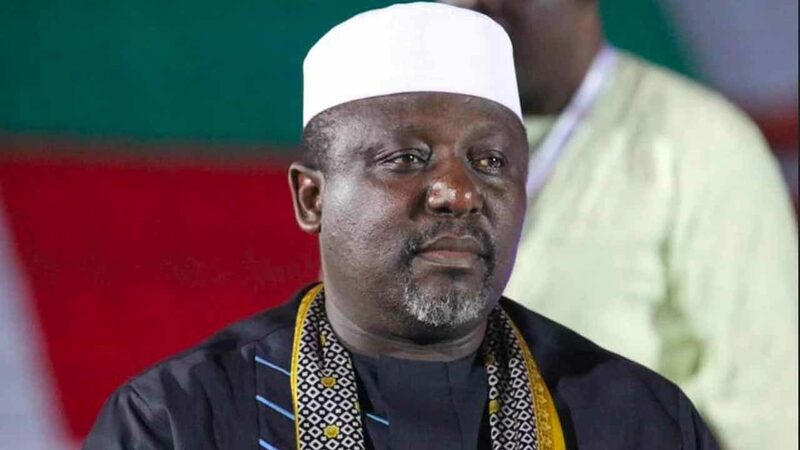 Finally, Rochas Okorocha, the Imo State governor has been suspended from the All Progressives Congress (APC) for ant—party activities. The party had been careful in managing excesses of one of its most visible governors, but not anymore. The glaring romance and support of the incumbent governor with the Action Alliance (AA) and its governorship candidate, Mr. Uche Nwosu who is also his son in-law has got to be checked. Governor Okorocha has never hidden his support for Nwosu and on many occasions, he has told anyone that cared to listen that he will stop at nothing to deliver Nwosu in the forthcoming election even at the detriment of his party, APC. According to him, APC under the leadership of Comrade Adams Oshiomhole had done him injustice and illegality, even after all his efforts in building, promoting and sustaining the party for years. For him, the worst the party could do was to deny him the privilege to produce his successor on the platform of the party he has laboured so much for, as well as subject him to undue treatment, politically and otherwise. For these reasons, Okorocha’s disposition is to undo the Imo APC going into the election and to also ensure that his preferred candidate prevails after the election. To drive his point further, on Saturday, January 12 at the official inauguration of the Women and Youth Campaign Team for President Muhamadu Buhari’s re-election, which was graced by top chieftains of the party across the country, including wife of Mr. President, Aisha, who was represented by the wife of the Vice President, Mrs. Osinbajo, Okorocha also used the opportunity to let the whole world know where is loyalty lies as far the governorship election in the state was concerned. He did not mince words to reiterate his unflinching support for Nwosu and he expressed the determination to see to Nwosu succeed against the choice of the APC, Senator Hope Uzodima. 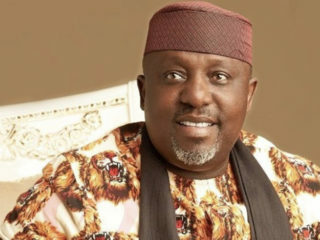 At the event, Okorocha enjoined Imo people to vote for Uche Nwosu, for the governorship position, stressing that APC owes Imo people apology for the injustice done to them by denying their preferred candidate the party’s ticket. In his words, “I want to correct an impression for some of you who are visiting this state, some of you think that there is tension in the state, it is not true. I am in charge and no sane youth will come and create tension in this state. All the youths must take my instructions. “Let me say this Madam First Lady, this time around we are not here to ask you to campaign for Buhari, what my wife has done is to tell you that Buhari is on ground. “Imo victory for Buhari is divinely sealed. 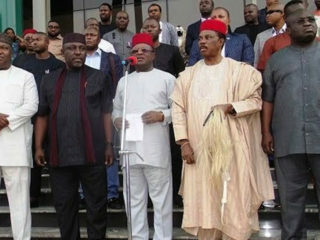 In Imo State we have 47 political parties and one of the perfect Alliance is Action Alliance led by Uche Nwosu. Nwosu is APC in spirit. In Imo state, Nwosu will win Imo State. It is not anti party. We refuse imposition in Imo state. “APC owes Imo people an apology because of the injustice meted to Imo people.” Okorocha said. In a swift reaction, Mrs. Osinbajo countered Okorocha and called on the supporters of APC and Imolites in general to vote for all the candidates of the party at all levels adding that APC will win in all the states of the country. 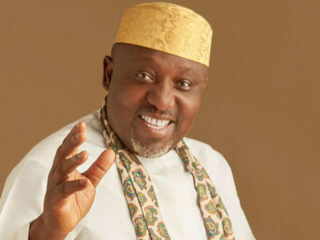 Consequently, in a meeting with all the President Generals, Youth and Women leaders, Councillors and other leaders of autonomous communities from Okigwe Zone of the state held at IICC, Owerri, Wednesday, Okorocha also reiterate that he will ensure victory for all AA candidates vying for respective elective positions, including Nwosu. He maintained that his support for Nwosu, even though he is of another party, is not anti-party activity, stressing that AA is in serious alliance in the effort to deliver Buhari come 16th February. “My actions are in no way known as anti party, rather the combination of AA and APC is henceforth known as perfect alliance.” He said. Okorocha promised to dole out over N3.5b to facilitate victory for President Buhari and Nwosu. It could be recalled that just recently, the governor made appointment of over 300 personnel into various parastatals and boards in the state. The idea, according to some political analysts is to empower them financially and otherwise in preparation for the election battle ahead. Meanwhile, some APC chieftains have viewed Okorocha’s actions as offence against the party, stressing that if something was not done urgently, Okorocha, true to his words might bring about the downfall of the party during the coming elections. Following this, a Disciplinary Committee set up by the newly inaugurated Caretaker Committee of the party in the state led by Hon. Matthew Omegara recommended Okorocha for expulsion from the party. Disclosing this to Newsmen on Wednesday, Omegara stated that after the committee had looked into the matter, coupled with the inability of Okorocha to honour their summons, the committee had no other option than to recommend his expulsion. Hear him, “I wouldn’t know if the State Working Committee or the National Working Committee of our party has expelled Okorocha but I know he didn’t show up in my Committee and with everything he has done, especially the one he did at the visit of the First Lady last Saturday compounded the whole thing. It is unheard of in a democratic setting. So the big questions now are; what will become of APC in Imo if Okorocha continues to canvass support for AA candidate in the state against the APC candidate? Can APC in the state win election without the input of the incumbent governor with all his paraphanelia of office and powers? Or will APC fair better if Okorocha is eventually expelled from the party as recommended by the Disciplinary Committee? Only time will tell. This is not to forget the fact that the AA national leadership has threatened to withdraw their ticket from Nwosu for going against the party in his support for Buhari. 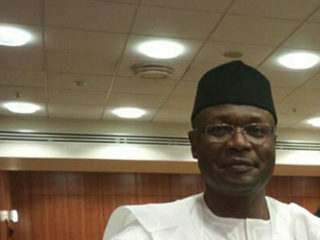 Speaking to the Newsmen recently, the AA, National Chairman, Mr. Kenneth Udeze said the AA as a party had adopted the presidential candidate of the Peoples Democratic Party, PDP Atiku Abubakar as its candidate for the 2019 presidential election. He also went further to warn the Imo State chapter to take cue and support the Atiku agenda while threatening to sanction anybody who goes against the decision of the party. “For your information, AA moved the motion for the adoption of Atiku as the Presidential Candidate of CUPP and we are on it to the end. On this note, let me warn all our members in Nigeria, and the lmo State Chapter in particular, that we don’t need any infraction in our party. In fact, there is no room for that. “It is our unshakable/unfailing resolve to work for the emergence of Atiku/Obi, in the Presidential election and that we must not only be seen to be doing, but to truly do. “I will not hesitate to invoke from relevant sections of our Party Constitution to deal with erring members no matter how highly placed, as AA constitution, which I swore to protect remains supremely sacrosanct. Please be warned.” Udeze said. Reacting, Nwosu said that no amount of threat would stop his support for Buhari. According to him, Imo AA had entered into perfect alliance with President Buhari to support his reelection and there is no going back on that.